Hawthorn is a state hospital for mentally ill children. We get kids aged from 6-17 from all over the state. While the children are sick, most of the time they behave like other kids. Many of them have been through severe trauma, some were born with problems. The great thing is the kids get better while they are here. About six years ago, not long after I started working at Hawthorn Children’s Hospital, I noticed some sunflowers growing in a weedy, fenced off area. 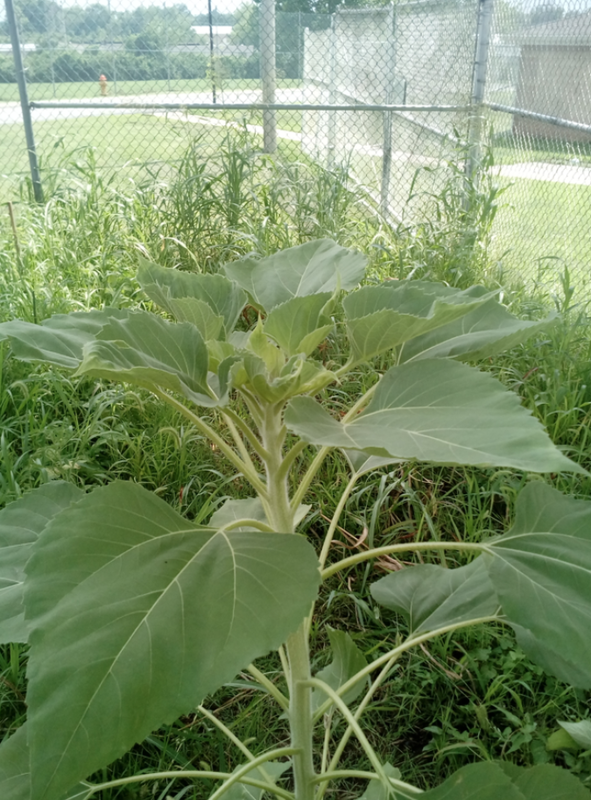 I asked some of my coworkers why there were sunflowers growing in a fenced off weed patch. I was told that the children used to have a gardening program, and they always planted sunflowers. The flowers had self seeded ever since they quit gardening. Since I had long experience gardening and wanted to do something extra to work with the kids, I along with others restarted the gardening program at Hawthorn. We took the seeds from the sunflowers descended from planting years ago to replant in the Spring. Gateway Greening was kind enough to supply us with tools, plants and a raised bed. A local Cub Scout pack’s leaders hauled a bunch of compost to improve the soil. The kids moved the compost and worked it in to the soil and we had a garden! The kids at Hawthorn stay for various times so there are always some experienced gardeners and some who haven’t see a tomato plant in their lives. Late winter the kids start some seeds. In the spring they prepare the soil, plan the garden and plant. In the summer they harvest and, not often enough, weed. In the fall they plant fall crops and put the garden to bed. Often kids know they will be gone before they see the fruits of their labor but they continue to work hard so other kids they haven’t met can enjoy their favorite flower or vegetable. The kids do almost all the work. A great thing about the garden is kids who might have had little success in their past can see (and eat) something they achieved. We always do some science lessons about pollination, seed germination and plant reproduction as we garden. For many kids gardening is a coping skill that helps them be calm (that works for me also). Other kids who have trouble with peer relationships will work well as a team to get things done in the garden. Some really enjoy teaching others about the garden, giving them an opportunity to help others. Of course some kids just want to eat a fresh tomato or strawberry. The kids eat the produce and pick the flowers. They always want to share with their peers, staff and families. I love the way kids get excited when they see what they accomplished with just a few seeds and hard work. Every year we save sunflower seeds to plant the next year. We always tell the story of the sunflowers planted by someone we don’t know that started something good that helps us today. I like to think that the many good things people do plant seeds that they may never realize flower.